It’s because I didn’t love the person who I was before the journey. Your weight changes, but you don’t. You’re weight changes but that doesn’t mean everything else will. I hated who I was and just because I now had a smaller frame, it didn’t change that mindset. Love yourself and who are you, be proud of who you are and work hard in other aspects of your life. You’re more than your body size, a whole lot more. Ahh Fluctuation, one minute I’ve got a glimpse of abs, the next I’m bloating. I’m 2kg smaller in the mornings that the evening… what?! It’s normal. With hormones, what you eat or drink and your emotions all playing a part in how your body is seen by the eye, please remember it’s normal to fluctuate. Furthermore than those daily fluctuations, it’s also normal for your body to change over time. Whether it’s at Christmas after eating a bit too many mince pies (cor I could do with one of those now).. or whether it’s because you’ve spent the summer partying… enjoying life means fluctuations and that’s completely normal & OK! Your body adapts, life happens, holidays / friends / family blah blah, even illness happens. Not every day you’re going to wake up feeling better than yesterday, not every month you’re going to get stronger. Relax and enjoy your journey, not everything is about winning constantly. Sometimes you have to lose to win bigger. Wow, and it’s this true. 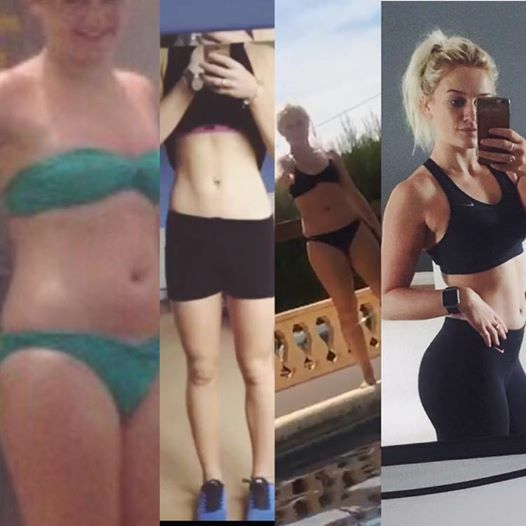 I never ever thought back when I was 17 running to shift my soft tummy would it be my career sharing my knowledge and journey with other females with my main purpose in life to change lives through health and fitness. NEVER! However, it’s not just my career it’s changed or my body. I feel I appreciate everything so much more, good quality food, local and fresh produce, the environment and all aspects of health. My mindset has changed and is a huge part of my life thanks to health and fitness. If you’re just starting out, please don’t think exercising and eating better will just change your body. It can change a whole variety of things, you just wait and see. Running 5k and then coming home to a huge bowl of carbonara following with 3 kitkats (stolen from the kitchen) and 2 yoghurts (who only wants one right?) and there I was wondering why my running won’t help me shift some fat? … Or I would be running 5k and living off salads and wondering why I had no energy to get out running? …Since my qualifications and since Jan this year my whole life has been changed via sorting out my diet. I enjoy ice cream (2 tubs of Oppo in 3 days just saying), I enjoy meals out, I understand the good foods and the better foods and I know how to fuel my body for the day ahead – but that’s only now. I really wish I knew diet played such a huge part early on because since getting that sorted, my lifestyle, my mindset, energy and relationships as well as my body fat % has improved so so much. What would you tell your previous self?